Is your Rowland Heights kitchen or bath starting to look dated? Need more space for a growing or changing family? Or perhaps you just want a fresh new change of pace. My Space Remodeling has the experience and expertise you need for a great room addition, kitchen remodel, or bathroom remodel. We can take care of it all, from helping you choose colors, materials and features all the way to framing, electrical, plumbing, and roofing. Our crews are also experienced in decks and patio covers, outdoor kitchens, patio enclosures, and gazebos to complete your Rowland Heights home improvement dreams. We’re fully insured and as a general contractor we hold the full compliment of licenses covering Rowland Heights for all of your home improvement needs. Whether you’re going for bath remodeling, kitchen remodeling, or even a second floor room addition you’ll have experienced professional designers, experts craftsmen, and professional foremen and project managers to keep your home remodeling project on budget and on schedule. We offer easy-payment terms as well as 100% financing (on approved credit). You’ll only deal with a single company from permits to construction, inspections and clean up. We’ll leave you with the house of your dreams and no mess. Consumer Reports has a great list of tips for choosing the right contractor at http://www.consumerreports.org/cro/home-garden/resource-center/choosing-a-contractor/overview/index.htm. One of the first steps is to confirm insurance and license numbers along with checking reviews and BBB reports. 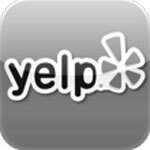 Also get a list of prior customers, ideally some you can contact and discuss their experiences. And before you make a decision, compare estimates and bids carefully. Is there anything left out? Are they the same in terms of quality and features? A bid becomes contract so it should include work and payment schedule, exclusions, warranties, and more. We’re often asked if permits are necessary, and we always answer absolutely yes! The Los Angeles County Department of Building and Safety is responsible for Rowland Heights and requires building permits for anything more than minor modifications and explicitly lists bathroom remodels and kitchen remodels involving plumbing and wiring changes, door and window replacements, decks, fences, fireplaces, patio enclosures, re-roofing, room additions, and stucco work. We’re licensed to do all of that work, and like any good remodeling contractor will take care of all of the paper work and plan reviews for building, plumbing, electrical, and other permits for you. We also know that our clients are also interested in the local housing market as part of their decision making. Zillow, Trulia, and Realtor.com put the list (advertised) price for the typical Rowland Heights home at nearly $730,000 but the closing (actual selling) prices are more like $589-595,000 — some $320 to $335 per square foot. That’s roughly the cost of a mid-range master suite, bath, or kitchen remodel and you save the expenses, hassles, and disruptions of moving. 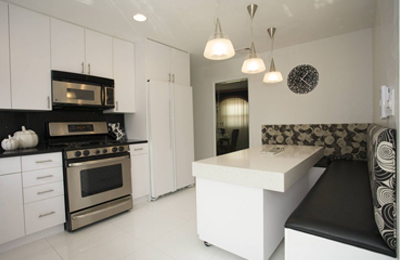 If you’re looking for more room, we can create unique new spaces perfectly suiting your needs and tastes. Many Rowland Heights homeowners have added a master suite with walk in closets and dressing areas, and a bath with custom tile shower and whirlpool tub. 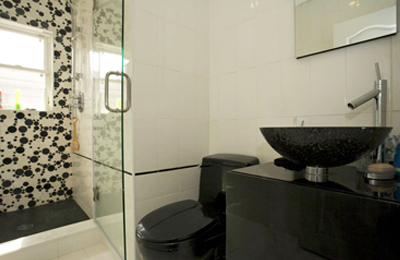 Simple bath and bedroom additions are also options, as are home offices and recreation rooms. Many families are adding a “mother in law” wing for parents. Love your backyard? Zoning permitting we can complete a second story room addition, although that’s more expensive due to structural reinforcements. A patio enclosure is an even more economical approach for a sun room or other living space. Have you been longing for a serene place to relax at the end of the day plus natural light and a new look to get you going in the morning? Then bathroom remodeling is definitely in your future. 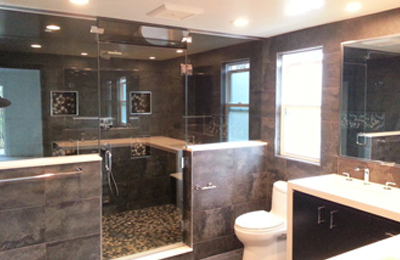 How about a walk in shower with custom tile and multiple jets or a rainfall shower head? Add a jacuzzi tub and you have your own spa. Almost everyone in Rowland Heights wants more storage and counter space. 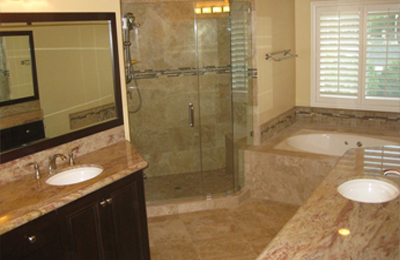 Our crews include specialists in decorative tile, glass and porcelain tile, and natural stone for counter tops, floors, walls, showers, and tub platforms. Our bathroom remodeling designers are experts in combining and contrasting colors and materials for whatever look you’re after be that natural, cheerful, or simply stunning. Your kitchen has a lot more than just appearances too coordinate. In addition to a great look you probably want efficient and convenient work areas from your kitchen remodel as well. Perhaps you have special appliances, fixtures, and features in mind. Such as gourmet ranges and vent hoods together with built-in double ovens. Or an amazing designer sink and faucet. Perhaps you’re leaning towards a modern, contemporary, or traditional look. We’ll make it happen. 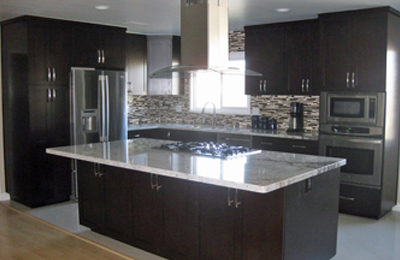 As general contractors in Rowland Heights we can create a completely different layout with the latest in kitchen cabinets, lighting fixtures and technologies, exotic wood or tile flooring, granite counter tops, tile back splashes, and more. Mention an outdoor party and most people imagine a deck and bar-b-que, or a night time celebration with a gazebo and festive lighting. Wood decks and gazebos are also great for everyday relaxing and enjoying the outdoors in Rowland Heights. 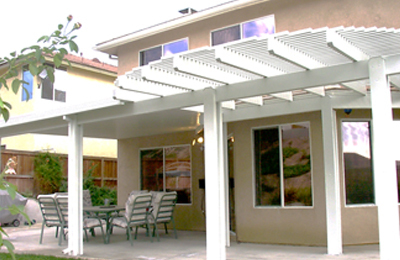 Or enhance your outdoor living with a great-looking patio cover to block out the hot summer sun. Enjoy the utmost in the backyard lifestyle with an outdoor kitchen featuring a gas grill, sink and storage, and refrigerator all tied together with exceptionally good looking stonework or masonry. Finally, if it’s been a while it may be time for re-roofing, exterior painting or stucco work, or door and window replacement. My Space Remodeling is a single company that can take care of everything.